The Collinsville City Commission will meet Monday Dec. 15th (at the City Hall Community Room, 106 N 12th Street) for a 7pm regular of the Municipal Authority & City Commission. 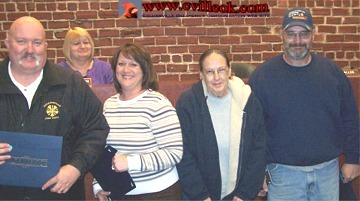 L-R: Fire Chief Russell Young, City Clerk Angela Long, Dispatcer Charolett Huck, and Sanitation Supervisor Henry Parks. B. Approval of Minutes of the December 1, 2008 Regular Meeting. C. Approval of Interlocal Agreement for Jail Services between the City of Owasso and the City of Collinsville. D. Approval of Resolution 2008-06 re: Grant Application Phase 2 Main Street Enhancement Program. E. Approval of Resolution 2008-07 re: Rural Economic Action Plan Grant. 8. Discussion, consideration and possible action to lift moratorium on outdoor advertisement (bill boards). -- approved, city staff now feels that the existing ordinances and appearance district rules cover any potential issues so the moratorium was lifted. The moratorium was started on Feb. 18, 2008 and renewed once. 9. Discussion, consideration and possible action to lift moratorium on exterior, ribbed metal buildings in commercial districts. -- approved, city staff now feels that the existing ordinances and appearance district rules cover any potential issues so the moratorium was lifted. The moratorium was started on Feb. 18, 2008 and renewed once. 10. Discussion, consideration and possible action to approve new City Logo. * City has met with OEM reps and all paperwork is now believed completed (for ice storm reimbersements?) but still not clear when money will arrive. * Christmas Parade & Merchant Giveaway were a success. * Expect repairs soon for heater in City Hall meeting room (which was a bit chilly for this meeting) ... before the city employees Christmas Party Thursday. * City staff held meetings to prepare prior to the current bad weather conditions. * City will be operating with a "skeletal" staff through much of the holidays. 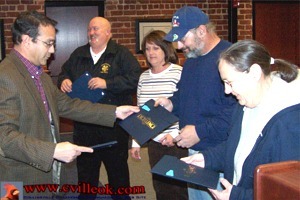 POSTED BY: Angela Long -- DATE: 12/12/08 -- TIME: 4:00 p.m.
Mayor Stan Sallee presented 25-year city service awards to Russell Young, Angela Long, Henry Parks & Charolott Huck Monday.